Ok, I didn't make this one, but it continues my cuteboy magnet marathon today, and so here it is. 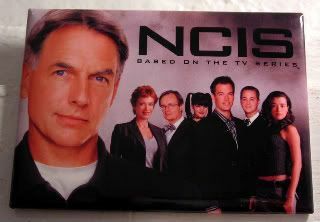 I just bought this one first, because it has cuteboy (sounds ridic to call him that, I know) Mark Harmon front and center (left?) with that half-smile that he does once in a blue moon. Seriously. I'd bet money that if Gibbs didn't kill me first, I'd spend half my day trying to make him smile that smile. I think you should have more cuteboys week/month.